Every time Latest in Beauty release one of their ‘Glamour Beauty Edit’ boxes, I already know before seeing what’s inside that it’s going to be amazing value for money. The boxes are always full of well known brands and most of the products are full size too so for less than £20 (the boxes are usually £14.95 or £16.95 – this one being the latter) they really are worth grabbing while you can. You’ll have to be quick though as I know they tend to sell out fairly quickly! 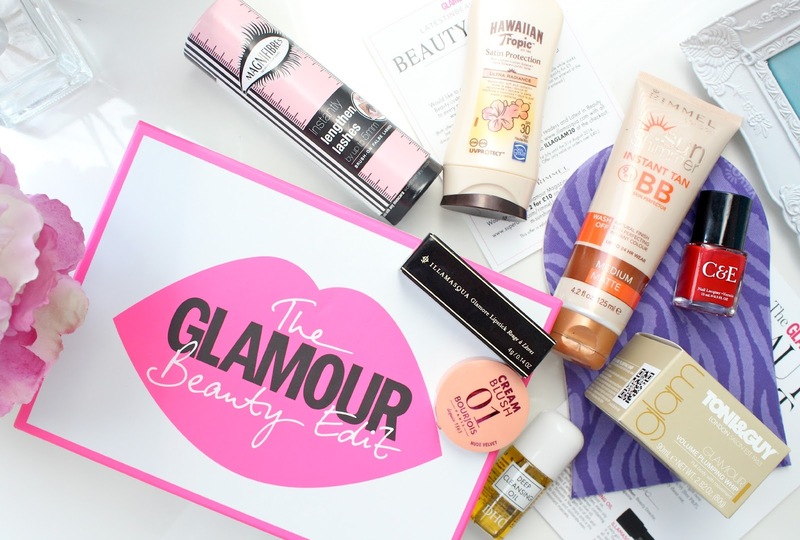 The latest Glamour Beauty Edit box is packaged beautifully in a white and neon pink box and contains a fabulous mix of products from nail polish, body and hair care to lipstick. The product I was most excited to see included is the Illamasqua Glamore Lipstick (RRP £18.50) as its from their brand new Glamore Nudes collection and is worth more than this entire box alone! I can’t quite comprehend how that works but I’m not complaining! The shade I received is ‘rose petale’ and it’s a beautiful rose pink as the name would suggest. Keep your eye out for a full review! I was also excited to see Magnifibres Brush-On False Lashes (RRP £18.95) featured in the box which again would cost more to buy alone than the whole box itself. This innovative product is designed to lengthen the lashes with fibres to you can achieve the false lash effect without the need for falsies! I’m not sure if I believe the claims but I’ll report back when I’ve given it a try. The Rimmel Sun Shimmer Instant Tan BB Skin Perfector (£6.99) is another product that I’m looking forward to trying as I’ve never heard of a BB false tan before and it promises to give the skin an instant glowing tan whilst hydrating and smoothing at the same time. I love the original Rimmel Sun Shimmer for a quick tanning fix so let’s hope I love this one just as much. The box also includes a Velvotan The Original Tanning Mitt (£2.99) to help with application! A couple of products I was less excited about would have to be the Hawaiian Tropic Satin Protection Ultra Radiance Sun Lotion SPF30 (£6.49) and the Bourjois Creme Blush 02 Healthy Glow (£7.99). That’s nothing against the products themselves but I’ve already been away on holiday so a high factor SPF will probably sit in a drawer unused (unless the UK weather perks up soon) and I already own the Bourjois crème blush. However, I think these products are fab additions if you’re jetting off somewhere sunny soon and haven’t tried the Bourjois crème blush – it gives the cheeks a healthy glow as the name would suggest and is perfect for this time of year. If you’re a nail addict, you’ll be very happy with the Crabtree & Evelyn Nail Lacquer (£6) in the shade ‘Apple’ which albeit is a fairly Autumn/Winter shade but very pretty nonetheless. I have to be honest when I say I wasn’t even aware Crabtree & Evelyn did nail polishes but I’m looking forward to giving it a try as I really like some of their other products and the packaging is lovely - very Chanel-esque! Last but not least, the final two products included in the box are the Toni & Guy Volume Plumping Whip (£7.19) and the DHC Deep Cleansing Oil (£4.50), both of which I'm really looking forward to trying. I've loved all the Toni & Guy hair products I've tried in the past and this one promises to create lots of volume and bounce at the roots. I've also heard nothing but good things about the DHC cleansing oil and as oils are my favourite method of cleansing, I'm sure I'll get lots of use out of it. I think its pretty safe to say that this box from Latest In Beauty is exceptional value for money with the total value of the contents being just shy of £80. Thats almost five times more than the £16.95 price of this box so if I was you, I'd snap one up asap before they sell out! Will you be grabbing one of these boxes? Which product would you be most excited to try? Need this box! Such a good deal! Ahh this is incredible, wish I wasn't on a spending ban now! Wow! I can't believe the amount of amazing goodies you get in this box - such a bargain! 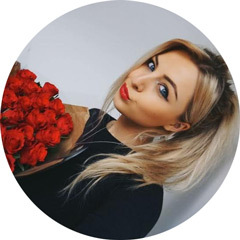 I really want to try something like this, great post Kayleigh! Theses boxes seem like a great idea, such good value for money! Can't wait to hear about the brush on lashes! Brush and nail polish look great! Can't wait to see the Magnifibres Brush-On False Lashes review. Need this box, you got some amazing products! it is indeed a very good deal! Awesome products! I ordered the box last week and so excited to get it deliver. I'm sure I will like it as much as I do.